(ST. CLOUD, Fla.) — Some St. 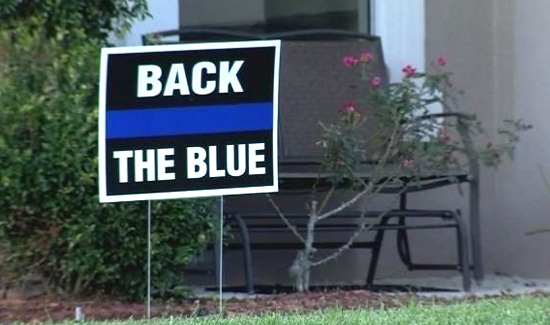 Cloud residents are outraged after they say their homeowners association demanded they remove “Back the Blue” signs from their yards. Bert Weston, one of the homeowners, posted the sign to show support for first responders. “We have friends that are police officers,” he told WFTV. Several of the signs can be seen throughout the Stevens Plantation neighborhood, but the homeowners association says the signs don’t comply with the its governing documents. Kirsten Thomas, another homeowner, told WFTV that while she understands she chose to live in a community with an HOA, she still wants to be able to show her support for law enforcement officers. “At the end of the day, I have a really hard time with the fact that two officers died in the line of duty keeping our community safe and I can’t show my support with the sign,” she said.